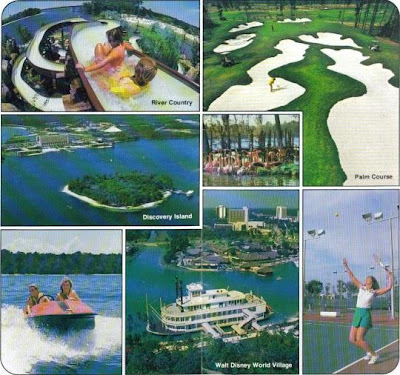 In 1981, just a year prior to the opening of EPCOT Center, there were not multiple theme parks, mini-golf courses, or Pleasure Island with which to fill your days and nights if you happened to be staying in the Vacation Kingdom. So, how exactly did you pass the time when you weren’t strolling around Fantasyland? Let’s take a peak inside the Tencennial DiscoverGuide and find out. Well, that all sounds like a lot of fun, but what do ‘River Country,’ ‘Discovery Island,’ and ‘Walt Disney World Village’ really look like? Okay, I’m sold, pack up the station wagon and let’s head on down I-4. 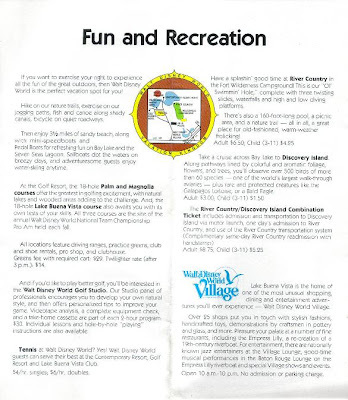 Ah, the memories this little guide brought back; the sandy shores and zip-line of River Country, the scavenger hunt on Discovery Island, and the much plainer buildings of the Walt Disney World Village. Walt Disney World seemed, and for all intents and purposes was, much simpler back then, but that didn’t make it any less exciting. If anything, it helped foster my imagination and nudged me into creating my own adventures, but that may have just been me. I know there are those out there that wish we still had River Country and Discovery Island, myself included, but I think if we pine for these lost, or rather forgotten, pieces of Walt Disney World we miss out on what we have been taught. Walt Disney World is a work in progress, and improving upon original places and concepts is fundamental to that work. Treasure/Discovery Island may be just a restroom for waterfowl on their way across Bay Lake, but the message and idea of connecting with the wild world around us has been given a much larger showcase now in Disney’s Animal Kingdom. The message that was given birth on Discovery Island has cultivated fresh ideas inside of Disney’s Animal Kingdom that the Island, in its limited capacity, could have never dreamed of. River Country, on the outside, may seem like an entirely different issue. The ideas of a watering hole don’t seem to have found many homes inside of Walt Disney World. The land itself has never been repurposed, even without venturing beyond the green fence that creates the border between Fort Wilderness and River Country, there are still visible signs of the once dream watering hole. Yet, lessons can be seen in the move from River Country to Typhoon Lagoon and Blizzard Beach. One such lesson was how much guests did not just want to plunge down a water slide, but that they also wanted to interact with their environment. From the simple zip-line, one can imagine, came a train of thought that would create attractions like the Shark Reef and the Downhill Double Dipper. Treasures like the Tencennial DiscoverGuide are treacherous to those who have memories of these experiences and those who wish they had had the opportunity to partake in such adventures. They can cause us to focus blindly on the past, while ignoring the present and future. However, when taken in the right doses and with the right mindset, they can be gems that help us meander memory lane and give us hope for a brighter future. Nice item Ryan. Was this one of your recent aquisitions? These items are wonderful in watching how the resort developed and expanded. It is also nice for the those nostalgia moments. Oh we saw the "abandoned" River Country on our boat ride to Ft. Wilderness this trip. It looked like so much fun. Where do you find all this crazy stuff?? I love these trips of nostalgia. Just like the Imaginerds' recent post about the book realeased for the tenth anniversary. I have no memories of a pre-EPCOT WDW, but I have a lot of memories of when WDW was a simpler place. There is a lot to be said of both versions. But like you said, it is an always progressing place that will always change. What it has become definitely suits the times, even if it occasionally disappoints us nostalgic folk. Fantastic - thank you for sharing that! I love old guidebooks and leaflets on anything Disney - especially from a time I never experienced (my first trip was 1988). We can't expect WDW to stay the same, but it's always nice to take a trip back and remember the 'simpler' times. Great post! I love seeing the literature and references to old and long gone attractions. I love history and what better subject in history to study than the history of such a fun place.